A giant of early-American golf, Charles Blair Macdonald was a pioneering player, administrator and part-time course designer who was raised in Chicago but sent to St Andrews as a young adult to study at the local university. Mixing with legends like Tom Morris senior and junior, Macdonald quickly fell for the ancient Scottish game and soon found himself on a crusade to increase its popularity in his homeland. In 1893 he designed the country’s first 18-hole course and the following year helped institute the USGA. His greatest legacy, however, was to come years later, when he retired to Long Island and built the National Golf Links of America. Macdonald starting planning the National when he moved from Chicago to New York in 1900, the idea being to create what he referred to as the ideal golf course; a seaside layout that would capture the very essence of links golf and faithfully replicate the best holes and features from abroad. After a comprehensive search for suitable ground, he purchased a 205-acre tract of swampy land close to Shinnecock Hills that skirted both Peconic and Bullhead bays and included naturally undulating areas to place his all-star holes. Armed with sketches and maps of the notable British links, Macdonald started work on the National in 1907, routing and designing the holes himself but hiring a local surveyor named Seth Raynor to assist with their construction. Understanding the need to build a course that not only stretched the better players but also allowed the weaker hitters to get around without great distress, Macdonald devised a strategic out and back arrangement with generously proportioned fairways and huge putting surfaces. The playing areas are dotted with punishing bunkers yet continually offer golfers an alternate route into the immense targets. Often crowned to play much smaller than they appear, the greens are shaped with severe internal contours and, when fast, are as challenging as any on the East Coast. The holes themselves are a mix of direct replicas and hybrids that Macdonald built by merging traditional links elements with the ground movement presented on site. Most of the really faithful replicas occur early in the round. The 2nd, for instance, is a version of the old Sahara hole from Royal St George’s and features a blind tee shot over a small hill and a green that falls away from the fairway and is hidden for those hitting too safely away from left-hand bunkers. The 3rd is a world-famous Alps hole, its drive played across a long diagonal fairway bunker and the approach over a steep hill and into a huge and heavily contoured hidden green. The other really famous copy is the par three 4th, a brilliant Redan hole with its long, angled target built atop a crest that falls naturally away to the rear. The Short and Eden par threes are also very good, as is the Road hole green complex at the 7th and the Principal’s Nose bunkers and double plateau putting surface on the par four 11th. 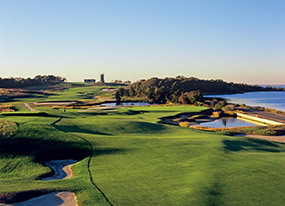 The best of the rest, however, are Macdonald’s strategic composite holes, such as the lumpy hog’s-back 5th and the classic cape-style 14th, heading diagonally across water and sand and offering players the option of shortening their approach by biting off more of the hazard from the tee. Set beneath the club’s iconic windmill, the clever punchbowl green on the 16th is equally memorable, as are steeply pitched targets on the 10th and 12th and the mid-length, multi-route 17th, which falls toward the sea and is deliciously bunkered to reward those able to hit aggressively up the tighter left hand side. 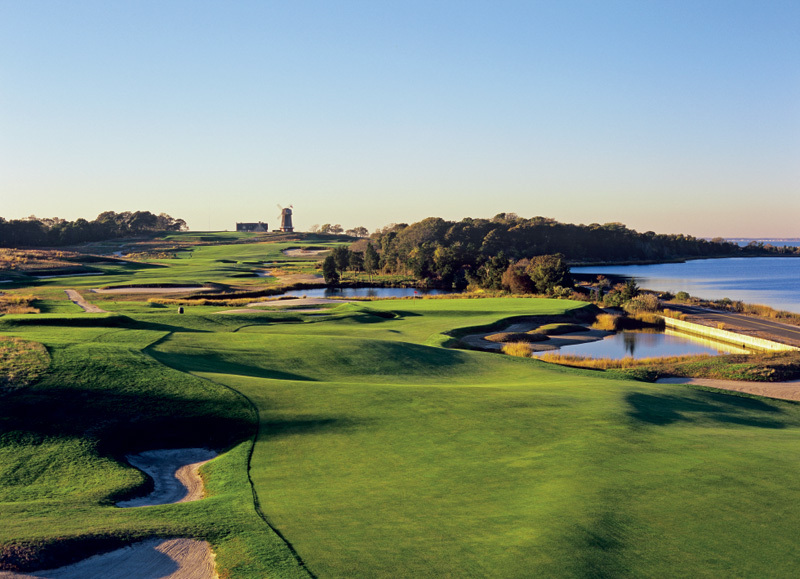 The round ends with a tremendous par five that runs along the bayside bluffs, the hole presenting golfers with loads of options and the possibility to both gain and give strokes back to par. When Macdonald built the National Golf Links of America his ambitious aim was to produce a layout that would rival the best links in Britain and, by virtue of its quality, help to elevate the game in this country to a higher level. By any measure he succeeded spectacularly. After running the club for 25 years, during which time he continually lengthened and refined his holes, Macdonald passed away in 1939, having left an indelible mark on the industry at large and a true golfing monument for a small group of his fortunate members.